"Bexley Royalty" is the namesake arrangement Flowerama has custom created for the city of Bexley. 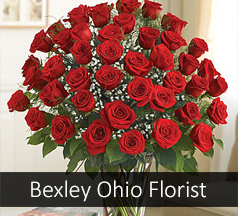 Looking for a real local florist to deliver flowers to Bexley, OH? Flowerama delivers fresh flowers, roses, planters, Cheryl's cookies, and other flower arrangements to Bexley and its surrounding neighbors every day of the week including Sunday. We are a local florist, owned and operated by the Ozment family, with four locations. We offer same-day flower delivery to Bexley and same day express delivery to Bexley. Order flowers online, or visit one of our flower shops near Bexley. We provide daily flower delivery to Bexley businesses, Bexley funeral homes, Bexley schools, and Bexley nursing homes.